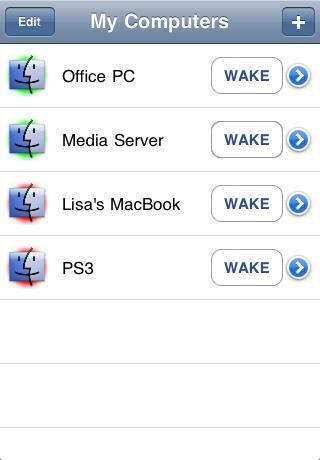 Even wonder how you can wake your PC up using iPhone, iPod touch or iPad? Now with the recently released new app named as Wake, users will have ability to perform wake function to any Windows or Macs PC or even servers remotely via iOS devices. The app was just pushed to App Store in early February but already getting good attention due to its simple but yet useful feature. Besides its wake button that can send WOL magic packet to wake up PC, there are also status indicators that will inform if those PCs are in ON or OFF state. The setup is pretty straight forward as it will able to automatically scan and detect the machines for easy setup. On top of these, users can even configure the iOS devices and by just shaking the device will activate the WOL function. Just imagine, now users can use this app to wake up any PCs wirelessly either through cellular data or Wifi network, then follow with VNC to access files remotely. Compatible with all WOL (Wake-on-LAN) capable PCs, the app is available for download in App Store and at merely $0.99, this is no doubt a worth-to-have app to remotely support or wake up any PCs while on mobility.